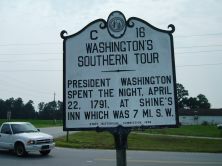 President Washington spent the night, April 22, 1791, at Shine's Inn which was 7 mi. S.W. George Washington, Revolutionary War hero elected as the first president of the United States in February 1789, is one of the most celebrated figures in American history. For more than two centuries, the story of his eventful life has been marked by both truth and legend. The concept of the presidency was new, and Washington was fully aware that his decisions would set precedents. He resolved to tour the United States to observe the political climate and culture, to thank his supporters, and to instill a sense of unity in the new country. As such, his tour and stops along the way became important landmarks in the areas he touched. 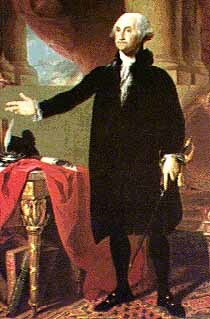 Washington’s stature in history is almost mythical, and has given rise to the popular claim—in well-known towns and obscure hamlets along the Eastern Seaboard—that “George Washington Slept Here.” The claims are not surprising, however, as Washington saw more of his country while in office than any other American president before the twentieth century. He also kept a detailed diary chronicling his travels. Washington departed New Bern after two full days of dining and dancing on April 22, headed toward Wilmington. As he left the town, he was escorted by some of New Bern’s leading citizens for several miles. He stopped in Trenton for a meal and then “lodged at one Shrine’s,” an “indifferent” inn or tavern along his route. The “Shrine” mentioned in his diary was probably a tavern operated by John Shine in Jones County. Shine can be found in the 1790 census as the head of a household containing nine whites and eight slaves. Washington’s tour was punctuated by visits with members of various Masonic lodges along his path and, during his time in Jones County, he was visited by the men of Trenton’s King Solomon’s Lodge. 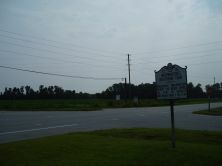 Washington left Shine’s tavern and enjoyed a quiet ride toward Wilmington for the next day.